Reading and share top 2 famous quotes and sayings about Silverstein by famous authors and people. 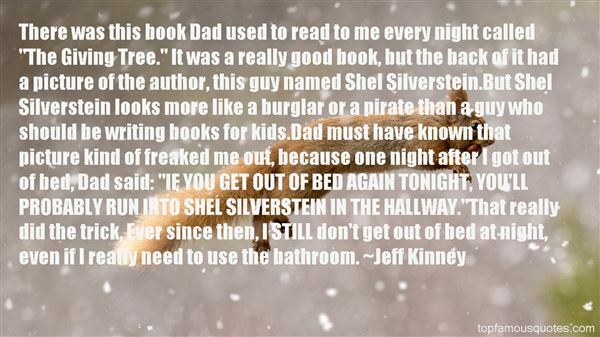 Browse top 2 famous quotes and sayings about Silverstein by most favorite authors. 1. "There was this book Dad used to read to me every night called "The Giving Tree." It was a really good book, but the back of it had a picture of the author, this guy named Shel Silverstein.But Shel Silverstein looks more like a burglar or a pirate than a guy who should be writing books for kids.Dad must have known that picture kind of freaked me out, because one night after I got out of bed, Dad said: "IF YOU GET OUT OF BED AGAIN TONIGHT, YOU'LL PROBABLY RUN INTO SHEL SILVERSTEIN IN THE HALLWAY. "That really did the trick, Ever since then, I STILL don't get out of bed at night, even if I really need to use the bathroom." 2. "I would read the Shel Silverstein poems, Dr. Seuss, and I noticed early on that poetry was something that just stuck in my head and I was replaying those rhymes and try to think of my own. In English, the only thing I wanted to do was poetry and all the other kids were like, "Oh, man. We have to write poems again?" and I would have a three-page long poem. 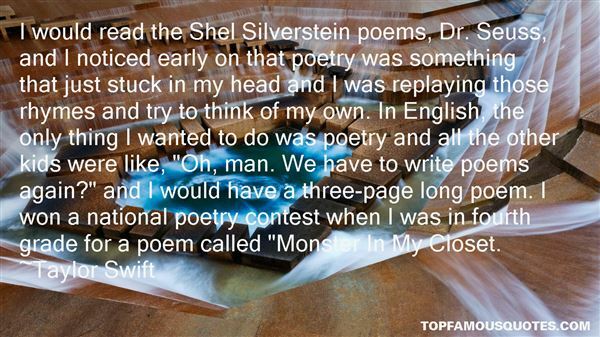 I won a national poetry contest when I was in fourth grade for a poem called "Monster In My Closet." My heart seems to heal, so that speaks well for my future."